Jackalopes made a donation to the Mountain Health 2013 Holiday Parties and we received the following thank you from one of the children that attended the party: Dear Santa Clause, Thank you for brining us presents every year. But who gives You presents? I wish I could deliver a present to the north pole for you. I want to give you a Strong magic sled. I would also give you a fast raindeer. Oh I forgot I will give you a puppy. 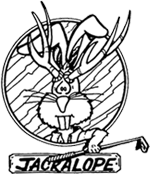 Jackalopes received a thank you card expressing gratitude for putting together our Spring 2013 Charity Golf Classic and the fact that we were honored to invite several Wounded Warriors, the writer stated; how great our efforts are in supporting our Armed Forces. Jackalopes received a thank you letter from Mountain Health Services for a donation made in support of their 2013 Country Fair. Your commitment to helping improve the health and social status of our communities is sincerely appreciated. Jackalopes received a thank you letter from San Diego Adaptive Sports Foundation for our contribution; Your contribution enables the Foundation to continue providing year-round adaptive sports opportunities to children and adults with physical disabilities. It also allows us to provide programming services to injured services members. Jackalopes received a thank you card from a person we made a donation to; There are truly not enough words to tell you how grateful I am. Jackalopes received a thank you letter from Sonshine Haven; Thank you for you donation in the month of November, 2013. This year with your support and the assistance of our wonderful volunteers and the amazing Hillsdale Middle School ASB food drive we were able to provide Thanksgiving baskets with all the fixings to 124 grateful families. Jackalopes received a thank you card; Your thoughtfulness and generosity is so greatly appreciated! It made a stressful and difficult time more bearable. Jackalopes received a thank you letter from the Burn Institute; On behalf of the Burn Institute and those we serve we would like to thank you for your generous grant in support of the Winter Camp Beyond the Scars.